Kate Finns Dolls Clothes are currently available for 21cm rag dolls. These pretty dresses are fully washable and also include bloomers. Watch this space as we add more dolls clothes for those styles that wear removable clothing. A gift given from Kate Finn’s range of superb, hierloom quality Rag Dolls will ensure that your gift stands out from the crowd! The rag dolls for sale at Kate Finn are heirloom products primarily made to be played with. So safe, soft and cuddly with their perfectly sewn dolls clothes including dresses, petticoats and pinafores in an amazing variety of truly lovely retro, modern and traditional fabrics. Their beauty enhances the décor of any child’s nursery. These items are an ideal alternative to our soft baby toys or the more delicate porcelain collectibles. To find out more about any of our items, including our baby toys and golliwogs browse our site or email us at order@katefinn.com.au. 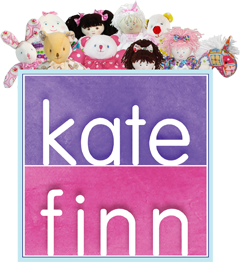 Begin your own collection or start one for your children from the extensive range available at Kate Finn. Doll stands are a handy tool to help to display your Rag Dolls and Golliwogs. They are available in four sizes, to find the correct size for your doll just click on the image and the correct size will be displayed below ready to add to your order.